Have you ever had a dataset that contains too many points to see a clear pattern at the scale you wish to view your map? 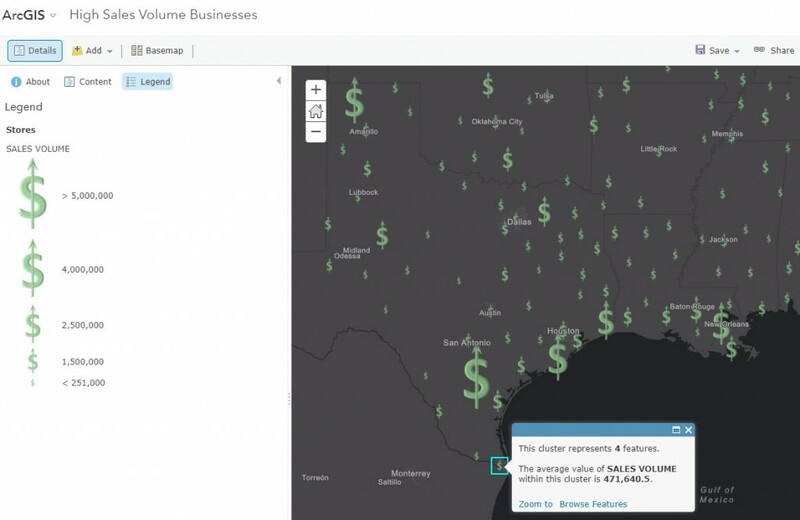 With today’s new release of ArcGIS Online, clustering is now available to help in this very situation, allowing you to find new patterns that are otherwise hidden. Less clustering (less generalization/aggregation/grouping) yields more dots on the map, and conversely, more clustering (more generalization/aggregation/grouping) yields fewer. As you zoom in and out, the clusters update based on your current map scale. 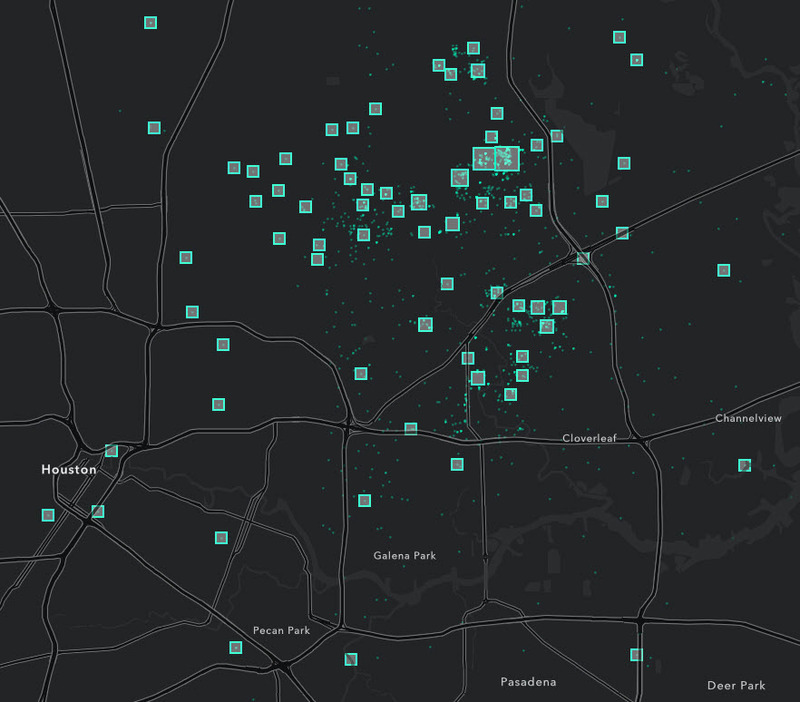 Clusters are proportionally sized by the count of features to visually cue the map reader that there are more items clustered in one location vs. another. Before clustering, there were very few options to display this information: labeling, in which the map reader had to read every label to even begin to assemble the picture; or heat mapping, which is great for lots of coincident points, but qualitatively different from depicting a cluster of points near each other. “Near” can mean different distances at different scales, and clustering naturally adjusts the size and quantity of clusters based on the current map scale. Step 2: Explore your data’s attribute fields. Say you have a points layer of police stops with an attribute containing the type of police stop each is. 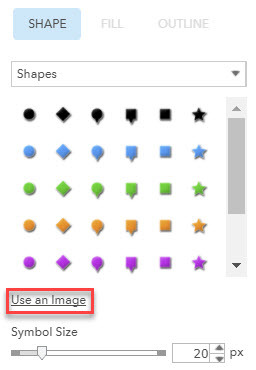 Click on the Change Style menu, choose an attribute to show, and select the Types (Unique Symbols) option to pick your colors. Next, select clustering in the More menu. Clustering works with numeric attributes as well. To map a numeric attribute, click on the Change Style menu, select the numeric attribute you want to display. 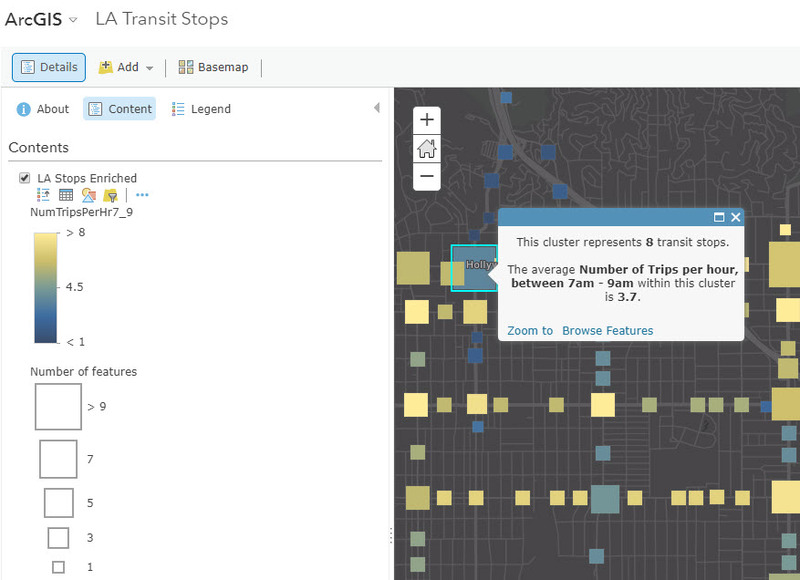 In this layer of Los Angeles Transit Stops, one of the attributes is the number of trips per hour in the morning rush hour (between 7am and 9am). Each stop has a number of stops per hour in this field, and as the points get clustered, we can get an average to display in the pop-up. Just as with the categorical fields above, whatever is currently symbolized will appear automatically in the clusters’ pop-ups. Here, we see the average number of stops displaying in the pop-up. 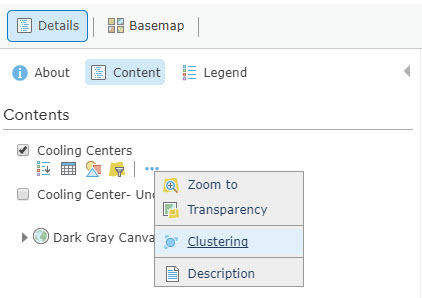 To truly customize your clusters’ pop-ups, click Configure Clustering Pop-up in the Clustering menu. Step 3: Add a filter to subset your data and clean up the noise. Using clustering with filters can be a powerful way to see more nuance in your data. 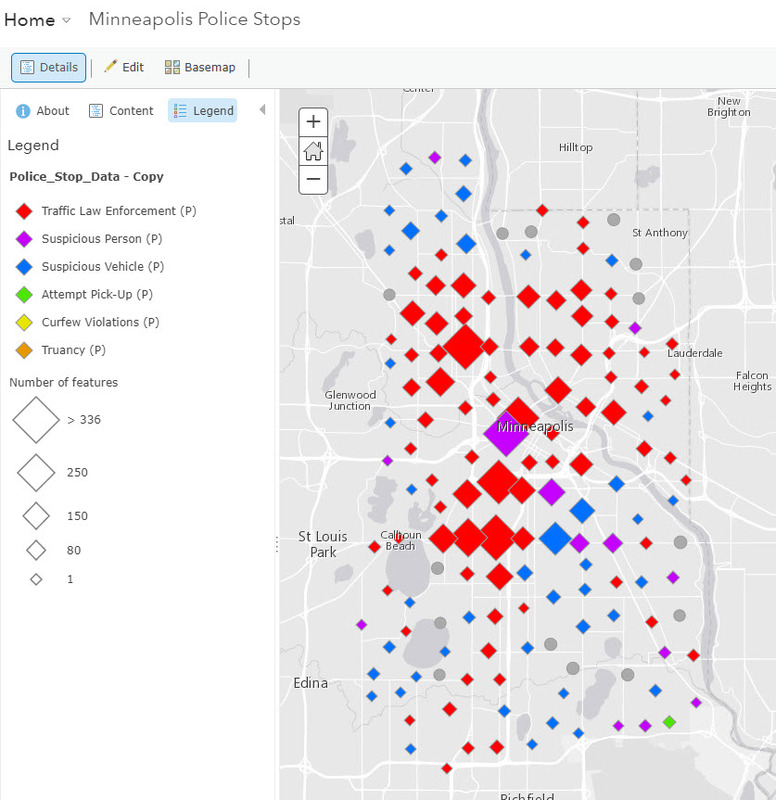 Going back to the Minneapolis Police Stops, say you’re only interested in stops for curfew violations – a small percentage of total stops – which does not show up on the predominance cluster map. First, simply filter your data such that only stops for curfew violations are displayed, then select clustering. Now we see clusters where there are a lot of police stops for curfew violations only, something that got lost in the first predominance map! One way to make your clusters pop is to use an image as your symbol. For example, say you are creating clusters of all U.S. Dunkin’ Donuts locations. You could use a pink or orange circle/diamond/square, but to take your map to the next level, why not use the logo to get a more interesting map? To do this, simply upload a small image as an item in your ArcGIS Online Content. Share and copy the link to the hosted image. Then, in the Change Style menu, select Use an Image, and paste the link to your image. 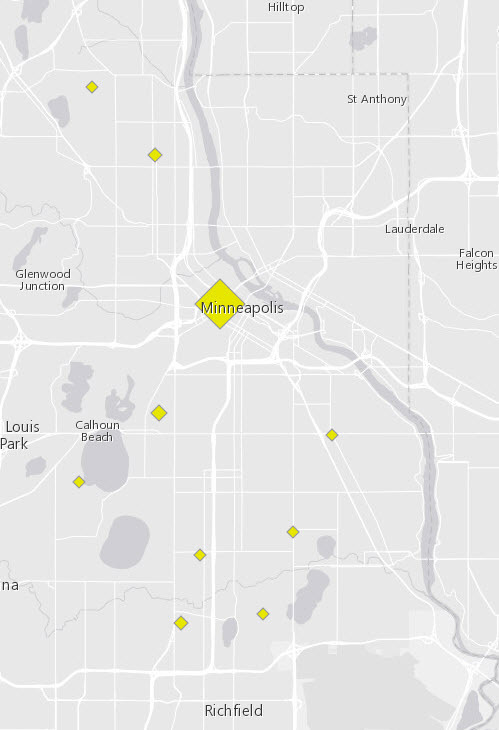 Experiment a bit with the symbol size, and let your map sing. A great way to display more context to your map readers is to display two layers: your clustered layer, and the original layer in a subtle, small symbol. Here we have a map of Hurricane Harvey SOS Rescues. The clusters are the proportionally-sized squares, and the small dots are the individual features. You can even adjust the transparency of the original features to make them more subtle compared to the clusters. This shows the map reader the clustering, but also the geographic distribution of the original points. It gives the map reader an automatic sense of how many points one cluster might represent, as well as how spread out the points are. 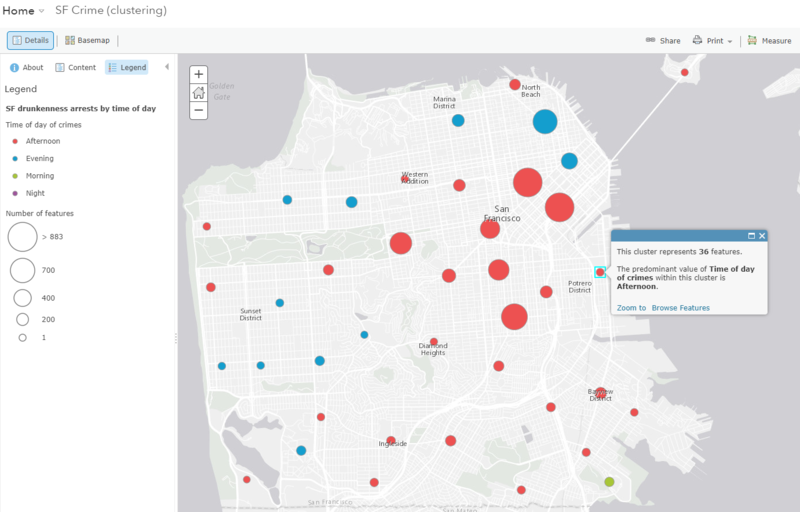 Clustering “forgives” imperfect x/y or lat/long location data. Imperfect x/y or lat/long values imply that your points are more precise than they really are. Clustering makes this lack of precision irrelevant. Clustering uses multiple locations to place the cluster, so the error in one feature will cancel out the error in another feature. Of course, this assumes the error across your locations is independent and identically distributed (not systematically erring in one direction, for example). The biggest benefit of clustering is that now, map authors have one more tool for data exploration and visualization. 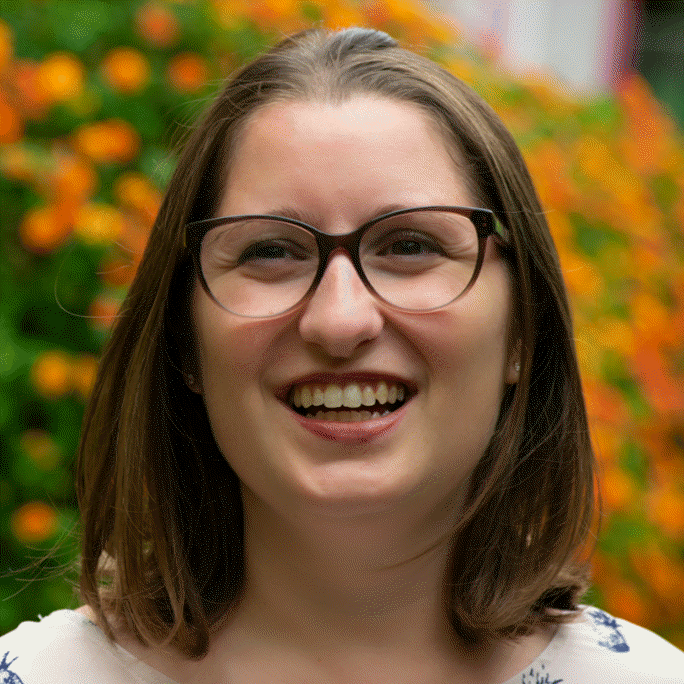 Data exploration and visualization is often just the first step to working with data, and can inspire ideas for actual analysis. Let the inspiration begin! 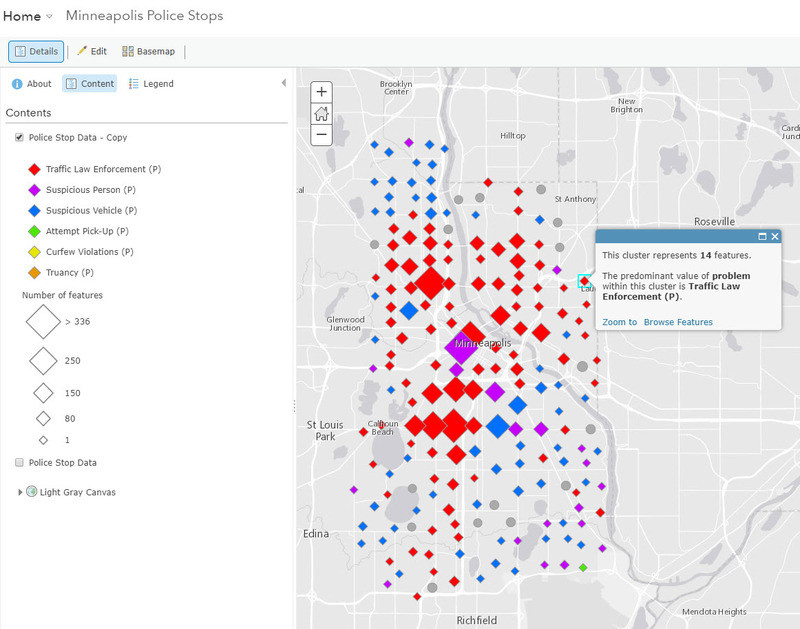 For a full interactive guide on using clustering in ArcGIS Online, visit this story map on Clustering. The official clustering help page and a quick video tutorial are also available.